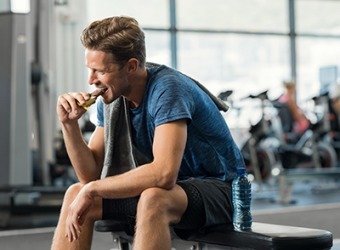 The chemical energy generated from eating the protein bar helps Christopher power through the rest of his workout. The definition of chemical energy is energy released in a chemical reaction or absorbed in the creation of a chemical compound. In the strictest definition, chemical energy is the energy involved in the bond formed between two atoms. Each bond within a chemical compounds involves different amounts of energy. When one of these bonds breaks, a chemical reaction occurs and chemical energy is used. The bond is released and is either reused in forming new bonds with other atoms or enters the surrounding atmosphere as heat. You can’t see chemical energy or touch it, but you can see it released when reactions occur. In fossil fuels, the chemical bonds between atomic structures are broken down. The energy released by this process is used to produce heat. This type of chemical energy is generally not renewable. Other types of chemical energy are renewable including such things as the heat put out by our own bodies. During photosynthesis, plants use the energy in sunlight to create and produce energy that they can use to grow and feed themselves. This type of energy is renewable. Exithermic Reaction - Reactions that give off quantities of heat such as the explosion of dynamite. Endothermic Reaction - Reactions that require heat to occur such as a chemical ice pack. An example of chemical energy is energy gained by eating food, which is then converted to heat and kinetic energy during respiration. An example of chemical energy with an exithermic reaction is when a stick of dynamite explodes. The TNT molecule is converted to water, carbon dioxide and carbon monoxide. Many bonds are broken and the energy supplied by the bonds breaking provides the energy to form the new bonds. The excess energy creates the visible explosion. An example of chemical energy with an endothermic reaction is a chemical ice pack. When the pack is broken and the chemicals inside mix, the reaction draws heat from the environment, thus you feel cold. "chemical-energy." YourDictionary, n.d. Web. 09 April 2019. <https://www.yourdictionary.com/chemical-energy>.